The division of society into the producing and the non-producing classes, and the fact of the unequal distribution of value between the two, introduces us at once to another distinction—that of capital and labour. . . . labour now becomes a commodity. . . . Antagonism and opposition of interest is introduced in the community; capital and labour stand opposed. The economic crisis of 1857 brought the shoe business to a halt, and the workers of Lynn lost their jobs. There was already anger at machine-stitching replacing shoemakers. Prices were up, wages were repeatedly cut, and by the fall of 1859 men were earning $3 a week and women were earning $1 a week, working sixteen hours a day. In early 1860, a mass meeting of the newly formed Mechanics Association demanded higher wages. When the manufacturers refused to meet with their committees, the workers called a strike for Washington’s Birthday. That morning 3,000 shoemakers met in the Lyceum Hall in Lynn and set up committees of 100 to post the names of scabs, to guard against violence, to make sure shoes would not be sent out to be finished elsewhere. One thousand women and five thousand men marched through the streets of Lynn in a blizzard, carrying banners and American flags. Women shoebinders and stitchers joined the strike and held their own mass meeting. A New York Herald reporter wrote of them: “They assail the bosses in a style which reminds one of the amiable females who participated in the first French Revolution.” A huge Ladies’ Procession was organised, the women marching through streets high with snowdrifts, carrying signs: "American Ladies Will Not Be Slaves," "Weak in Physical Strength but Strong in Moral Courage," "We Dare Battle for the Right," "Shoulder to Shoulder with our Fathers, Husbands, and Brothers." 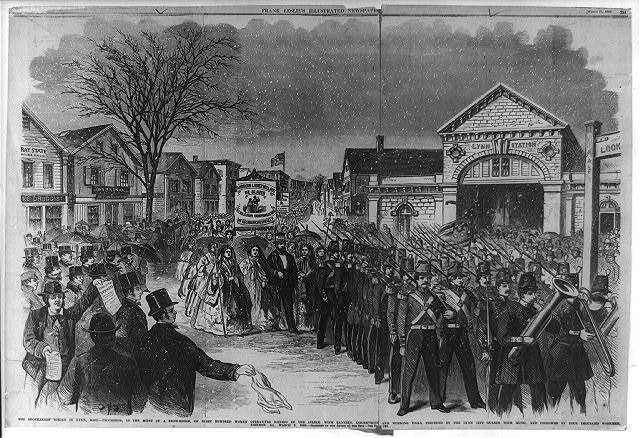 Ten days after that, a procession of 10,000 striking workers, including delegations from Salem, Marblehead, and other towns, men and women, marched through Lynn, in what was the greatest demonstration of labour to take place in New England up to that time. Police from Boston and militia were sent in to make sure strikers did not interfere with shipments of shoes to be finished out of the state. The strike processions went on, while city grocers and provisions dealers provided food for the strikers. The strike continued through March with morale high, hut by April it was losing force. The manufacturers offered higher wages to bring the strikers back into the factories, but without recognising the unions, so that workers still had to face the employer as individuals. Most of the shoeworkers were native-born Americans, Alan Dawley says in his study of the Lynn strike (Class and Community). They did not accept the social and political order that kept them in poverty, however much it was praised in American schools, churches, newspapers. In Lynn, he says, “articulate, activist Irish shoe and leather workers joined Yankees in flatly rejecting the myth of success. Irish and Yankee workers jointly… looked for labour candidates when they went to the polls, and resisted strikebreaking by local police.” Trying to understand why this fierce class spirit did not lead to independent revolutionary political action, Dawley concludes that the main reason is that electoral politics drained the energies of the resisters into the channels of the system. Dawley disputes some historians who have said the high rate of mobility of workers prevented them from organising in revolutionary ways. He says that while there was a high turnover in Lynn too, organising discontent.” He also suggests that mobility helps people see that others are in similar conditions. He thinks the struggle of European workers for political democracy, even while they sought economic equality, made them class-conscious. American workers, however, had already gained political democracy by the l830s, and so their economic battles could be taken over by political parties that blurred class lines. This article was taken from Howard Zinn’s excellent A People's History of the United States.We heartily recommend you buy A People's History of the United States now . OCRed by Linda Towlson and lightly edited by libcom - US to UK spelling, additional details, clarifications and links added. this translation was erased further to an aggressive mail reproaching us for putting an amazon link to the book of Zinn (as libcom) instead of a link to the French editor. The Lynn shoemakers (who called themselves from about the 1790s-1830s "mechanics" and from the 1830s until their demise as a class of workers "Jours") didn't work in factories in the 1830s or 1840s. The factory system didn't become widespread in Lynn until after the Civil War. Up until then Lynn shoeworkers go their stock from the bosses and made shoes in small shops called 10-footers. This is important because it disproves Marx a bit when he put emphasis on the proletariat, ie factory workers who did not own any capital. The Lynn shoeworkers developed a class consciousness while in a quasi state between artisans and proles, they owned their tools and sometimes owned their shops, but not the shoes that they made or the pay that they got. Paul G. Faler wrote a book called "Mechanics and Manufacturers in the Early Industrial Revolution" which focuses on the development of a militant working class in Lynn, MA which is a wonderful read for anyone interested in radical working class history. It's on par with EP Thompson.